AERIAL-SINDH PROVINCE, PAKISTAN-AUG 14 : Flood victims grab aid being dropped from a Pakistan Army helicopter August 14, 2010 flying over Sindh province, Pakistan. Flood waters continue to cause suffering over two weeks on after the floods began effecting as many as 20 million people according to a government statement. The country\'s agricultural heartland has been devastated as rice, corn and wheat fields are flooded creating a massive lake that goes on for many miles. 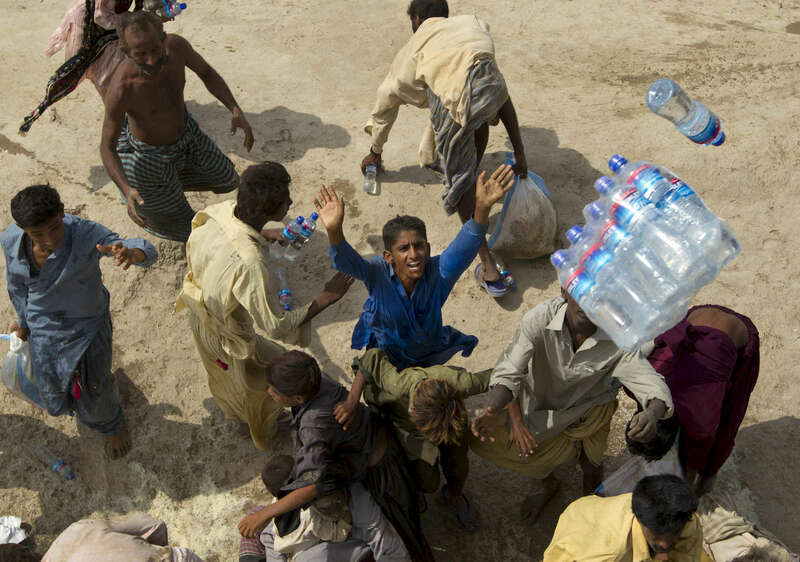 Pakistan is suffering from the worst flooding in 80 years as the army and aid organizations struggle to cope with the scope of the wide spread scale of the disaster which has killed approximately 1,600 people and displaced millions. In addition, Pakistani\'s have become more frustrated with the government\'s response and a lack of foreign aid. The U.N has described the disaster as unprecedented.